San Diego is a birder’s paradise with over 500 species of native, migrant and exotic birds gracing the coastline and inland areas. It’s also no secret that between drought and urban sprawl, wildlife habitats are shrinking. When it comes to birds, this means disrupted migratory patterns, a negative impact on health, threats to human food production (some birds help pollinate crops) and a number of other adverse effects. Adding nutritious sources of food for backyard birds in your outdoor living space can help sustain struggling local populations. Here is how to do it. First, think about the types of birds that you’d like to attract and then plan the feeder and food around that. Note that the options listed below are dense with fat, an essential nutrient to keep energy levels up. Different than your average grey striped sunflower seeds, black-oil versions are preferred by the largest variety of birds. They are smaller, a solid dark grey color and have a papery shell that is easy for birds to pick through. It’s also considered a better buy since 70% of the seed (versus a bit over 50% in a standard sunflower seed) is meat. Place black-oil sunflower seeds in a feeder, on a plate or scatter it on the ground for birds. Or, do all of the above. If cost isn’t an issue, opt for sunflower hearts (shelled sunflower seeds). The lack of shells make them easy for small birds to enjoy while larger ones also benefit from their nutritional value. They’ll generate less waste around feeding areas because birds won’t have to pick off shells. However, they will need to be served from some sort of weather-proof feeder as they do spoil easily when wet. Peanuts in the shell are preferred by larger birds including crows, doves, jays, woodpeckers, and wrens. Some birders prefer shelled peanuts as some smaller birds can also crush them into little pieces. 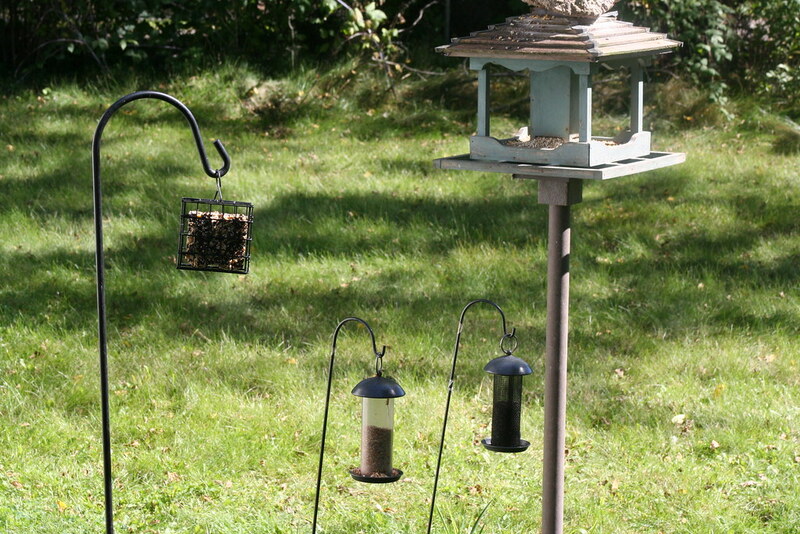 There are specialized, squirrel-proof feeders designed to distribute whole peanuts. Alternatively, some birders smear small chunks of peanut butter on trees, mix it with suet or leave dabs of it on platform feeders for birds to enjoy. The reason for small portions is so that the birds don’t risk getting it on their feathers or swallowing too much stickiness at one time. Suet cakes are easy to buy but be prepared to load up as birds love them. Suet is animal fat (the cakes may also have other ingredients like seed or cornmeal in them) that the birds need to for energy and to survive cold. Insert the cakes into a cage-like feeder that the birds can hang off of as they nibble. Because suet is fat, keep it out of direct sunlight as it can melt which risks it becoming rancid quickly and sticking to feathers. Forget the artificial dyes (though the color does attract hummingbirds) and make your own hummingbird nectar in a 4 parts water to 1 part white table sugar ratio. Start by boiling the water and then adding in sugar. Then, boil again until the sugar is dissolved. Let it cool and then pour the mixture into the hummingbird feeder. 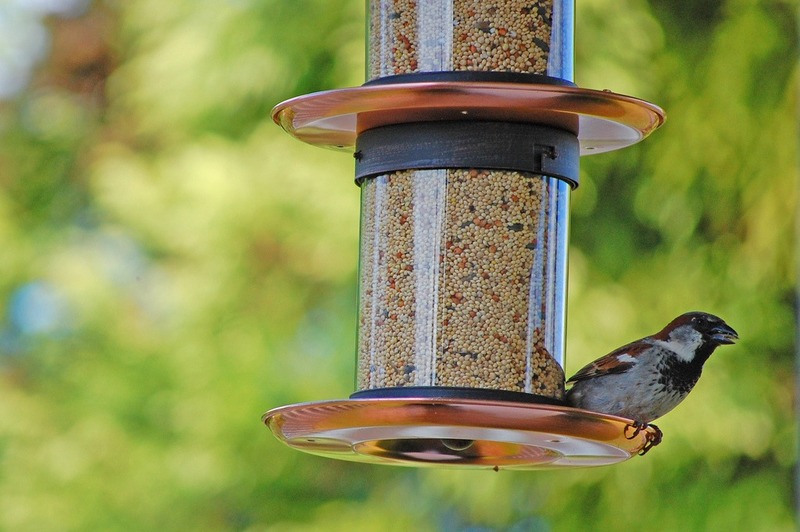 Many bird enthusiasts opt for a single feeder with mixed seed inside. However, this may lead to each species of birds digging through the mix to find their favorites while kicking the rest around or to the ground. This tends to happen more frequently in tube feeders as birds empty them to find preferred seed. The waste that happens with mixed seed bothers some birders, but not others. Also, mixed bird seed that is popular in Connecticut might not be a hit here in California. It pays to check what’s inside to make sure it attracts the backyard birds that you like. Mixed seed also tends to attract problem species such as pigeons. 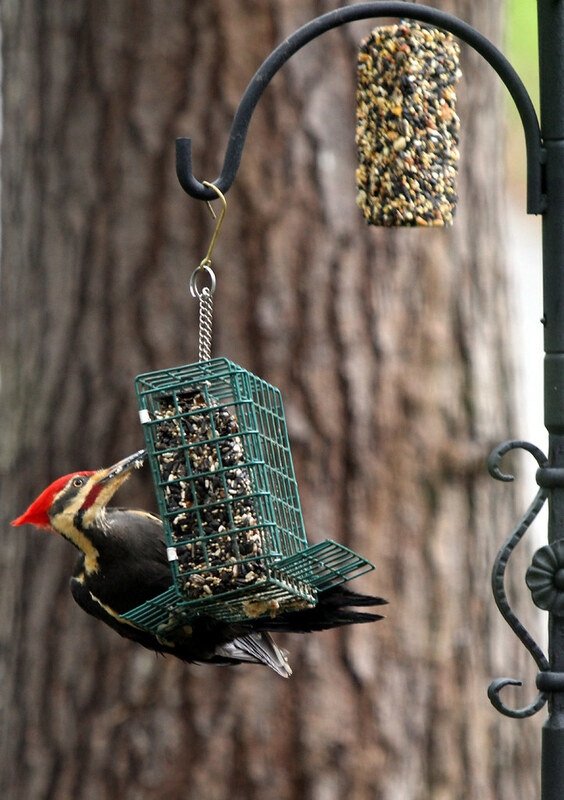 If this happens, switch to black-oil sunflower seeds in a tube or hopper feeder (both are more difficult for these birds to access) until they move onward. To solve the problems mentioned above in regard to mixed seed, install a backyard bird station. Each of the multiple feeders can hold a different type of seed. This is your best chance to attract a larger variety of birds. 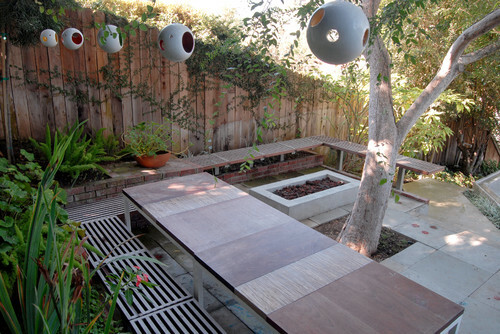 As you can see above, this can be done in a style that suits your home. You might need to experiment with bird feeder placement by moving the feeder(s) around a few times to see which spot garners the most attention. Keep bird feeders at least three feet away from your house to prevent birds from accidentally flying into windows. Glass fencing provides the same risk and probably calls for a greater distance. Feeders perched off of the ground reduce the likelihood that cats, squirrels and other wildlife will raid the food stash. 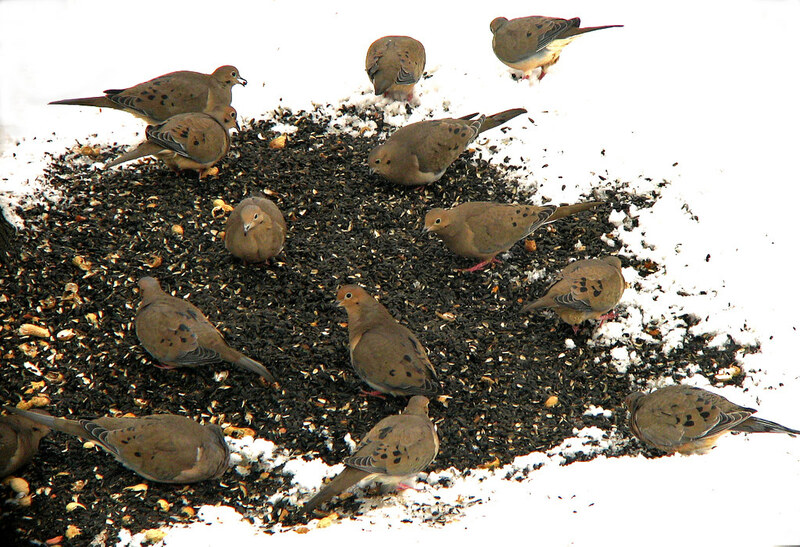 But if other wildlife isn’t a risk, ground feeders may attract ground foragers such as doves and jays. Birds are likely to feel more comfortable flying into a yard if there is some cover nearby to shield them from predators and wind. Keep in mind that the birds also need to be able to see the food so hiding it under the cover of a tree might be prohibitive. Strike a balance and the birds will come. Where there are birds and bird food, there will also be droppings so an easy-t0-clean spot is best. And speaking of easy-to-clean, whatever bird feeder you purchase should possess this characteristic as clean feeders are critical for prohibiting the spread of germs and disease. Consider adding a source of fresh water to keep them hydrated, happy, and likely to stick around a while. It’s a good idea to only put out an amount of food that can be eaten by nightfall to avoid the risk of predators and food becoming damp. The latter causes seed to spoil. It will be necessary to periodically clean and disinfect a bird feeder. How you do it depends on the type, but it’s a process that is critical to the health of the feeding birds. How do you feed backyard birds?